Are you a Carolina Tiger Rescue regular? Well, you’ll find an upgrade to the sanctuary’s tour path on your next visit. Tour fences have replaced the former tour barriers. The new fences are 4-feet high and 4-feet away from the enclosures. They were installed as part of Carolina Tiger Rescue’s commitment to the safety of both the public and the resident animals. 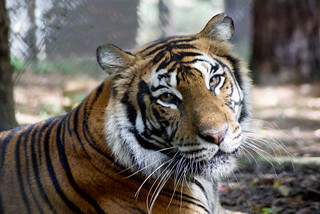 Carolina Tiger Rescue is a federally-accredited wildlife sanctuary in North Carolina. In line with our mission of rescue, education, and advocacy, the organization offers public tours on Fridays, Saturdays, and Sundays. Guided by a trained team member, tour guests will have a chance to meet some of our most beloved animals, hear their rescue stories, and learn what issues they face in the wild and in captivity. The upgrade stretches across the tour path, and the fences are 4 feet away from enclosures. More than 19,000 guests visit Carolina Tiger Rescue each year for public tours, where they have a chance to see Elvis Serval, Rajah Tiger and Jericho Cougar – just to name a few – up close. The construction of the tour fences began about four weeks ago. A hardworking crew started the process by drilling holes in the ground along the tour path, where there are about 30 of Carolina Tiger Rescue’s 48 residents. They later installed poles, fencing, and gates, which will give keepers and other trained team members access to the enclosures. During the project, the old tour barrier remained intact. It was completely removed Thursday to mark the close of construction. Tours have continued to book weeks in advance, and Carolina Tiger Rescue is thrilled by how eager people are to visit and learn about our animals! The new tour fence can be seen at a distance. Carolina Tiger peers up through the new tour barrier.